External views and axial section of Lituonella roberti, from Loeblich & Tappan (1964a). 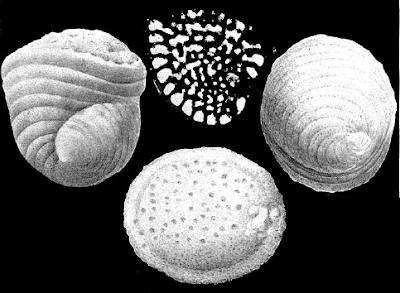 The Pavonitinidae are a group of Foraminifera known from the Upper Jurassic to the present (Loeblich & Tappan 1964a). Characters (from Loeblich & Tappan 1964a): Test trochospiral, at least in early stage, with three to many chambers to whorl, later may be reduced in number of chambers to biserial or uniserial, chambers may be subdivided by pillars or partitions; wall of agglutinated calcareous fragments or microgranular.